Usually seen in marigold and, to a lesser extent, in amethyst/purple ruffled bowls. Most bowls have six ruffles, but some have 10, as in the two shown here--and are a bit more desirable. 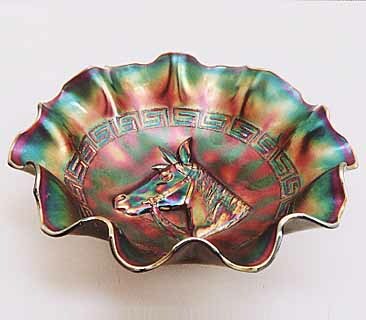 Sixteen-ruffled bowls are also known. Ice cream shaped bowls are very rare, as are plates. 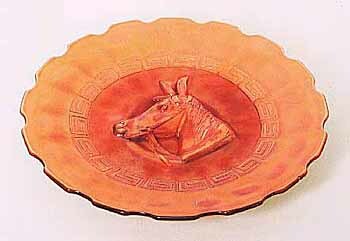 Pony has been reproduced in plates and bowls. 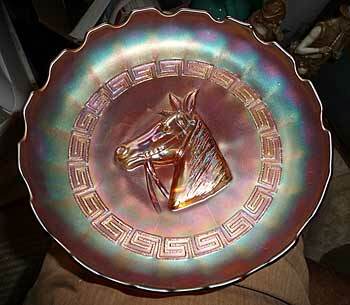 If a Pony piece is iridized on the bottom of the base, it is new. A lot have been showing up on eBay recently. 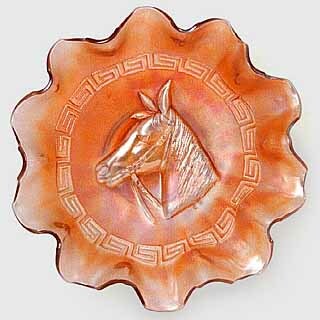 Ice cream shaped bowls are very rare in the Pony pattern. This dark marigold example is in the collection of Greg Dilian. I have records of only two others selling at auction in the last 20 years. The marigold plate below sold for $2,400 in 2002. It sold again in 2003 for $950. In 2002, amethyst and marigold plates sold for $110 each, the auctioneer stating that they were believed to be old. In 2006, a similar marigold plate brought $135 and in 2012 one brought $375. In 2015, a marigold plate, said to be old, brought $200. Buyers seem to be very skeptical of all plates.